A man walks past a branch of the People's Bank of China in Lin'an city, Zhejiang province on June 25, 2013. China's growing debt levels have continued to raise doubts about the country's financial management after warnings that shadowy lending practices are putting banks and investors at risk. The government has waged a publicity campaign to calm financial concerns since March, when two international bond rating agencies lowered outlooks for China to "negative" from "stable," citing slow reforms and faster loan growth. The findings by Standard & Poor's Ratings Services (S&P's) and Moody's Investors Service were followed by a warning from Fitch Ratings in April that debt levels had become "a mounting source of systemic vulnerability." The government dismissed the reports last month after announcing that China's gross domestic product rose at a 6.7-percent rate in the first quarter, keeping within the official target range. The results proved that the rating agency "pessimism" was "overplayed and misplaced," the official Xinhua news agency said. Officials also took heart from a separate Moody's report on April 27 that China's debt was unlikely to result in "an imminent financial shock," despite a rise in domestic credit to 196.8 percent in GDP, an increase of 53.2 percentage points in five years. The report eased some concerns sparked by the earlier warnings, the official English-language China Daily said. But a surge in first-quarter lending renewed fears that the government had set aside debt worries in an effort to pump up GDP. Yuan-denominated bank lending climbed 25 percent during the period from a year earlier to 4.61 trillion yuan (U.S. $705 billion), while total social financing (TSF), a measure that includes non-bank lending, soared 41 percent to 6.59 trillion yuan (U.S. $1 trillion). On April 27, Moody's voiced further concerns with yet another report, this one on "shadow banking," a murky branch of poorly-regulated financing that has stirred controversy since 2010. At the outset, shadow banking grew largely out of off-balance-sheet operations by major banks that offered loans and "wealth management products" (WMPs) to investors at higher-than-regulated rates. Over the years, shadow banking has spread to include increasingly creative instruments and financing schemes from institutional and informal lenders that evade regulation in the darker corners of China's vast money machine. While regulators have partially reined in the "core" shadow banking activities of big banks, "non-core" offerings and WMPs from mid-sized and smaller banks have been expanding, according to the Moody's report. One result is that "total social financing" does not account for total credit activity. "TSF may actually understate the true amount of leverage in the system because it excludes various forms of shadow banking activities that are expanding rapidly," said Michael Taylor, a Moody's managing director, in a press release. The same may be said for the official total of outstanding loans from financial institutions, which stood at 98.5 trillion yuan (U.S. $15 trillion) at the end of March, up 14.7 percent from a year earlier, according to People's Bank of China (PBOC) data. S&P's has estimated that China's debt burden has risen as high as 280 percent of GDP. Complex shadow banking maneuvers have allowed hard-pressed state-owned enterprises (SOEs) and property developers to maintain access to credit at a time when the government is cracking down on perennial debtors, known as "zombie" companies. By involving an intermediary third party, such as a trust company or brokerage, banks can disguise loans as "investment receivables" or "debt receivables," reducing loss provision requirements and accounting of non-performing loans (NPLs), the Financial Times said. Debt receivables jumped 63 percent to 14 trillion yuan (U.S. $2.1 trillion) last year, the paper said, citing an analysis by New Zealand-based Wigram Capital Advisors. The huge volume of such disguised lending, also known as "channel loans," may make a mockery of official claims that the NPL ratio for China's banks is still only 1.75 percent, as of April 30. The ratio barely budged from 1.64 percent in 2014 to 1.67 percent at the end of last year. Critics say banks have kept it artificially low by rolling over SOE loans that would otherwise be in default. The official number published by the China Banking Regulatory Commission (CBRC) is "ridiculously low," said Derek Scissors, resident scholar at the American Enterprise Institute in Washington. "That's off by at least a factor of 10. That's a range that is more reflective of the situation," he said. Even without shadow banking subterfuge, China's regulators have simply refused to categorize SOE bad debt as non-performing. "We're pretty close to the fact that no loan to a state-owned enterprise can ever be a non-performing loan, ... even if they can't pay it back unless you give them more money," Scissors said. Unease within the government and party leadership over the debt problem is apparently growing, despite blanket assurances that the rating agency warnings are overblown. Last week, the Communist Party's flagship People's Daily published a lengthy front-page interview with an unnamed "authoritative person," sounding similar warnings in even stronger terms. "High leverage inevitably leads to high risks, which, without proper management, can trigger a systemic financial crisis, cause negative economic growth and even eat up people's savings, and that's fatal," said the commentary, as quoted by Bloomberg News. Analysts are uncertain whether the criticism represents an internal split over the first-quarter loan splurge or a new direction for economic policy. On Friday, some analysts speculated that banks were told to slam on the brakes after the CBRC announced that new loans in April fell nearly 60 percent from March and 21.5 percent from a year before to 555.6 billion yuan (U.S. $85.2 billion). 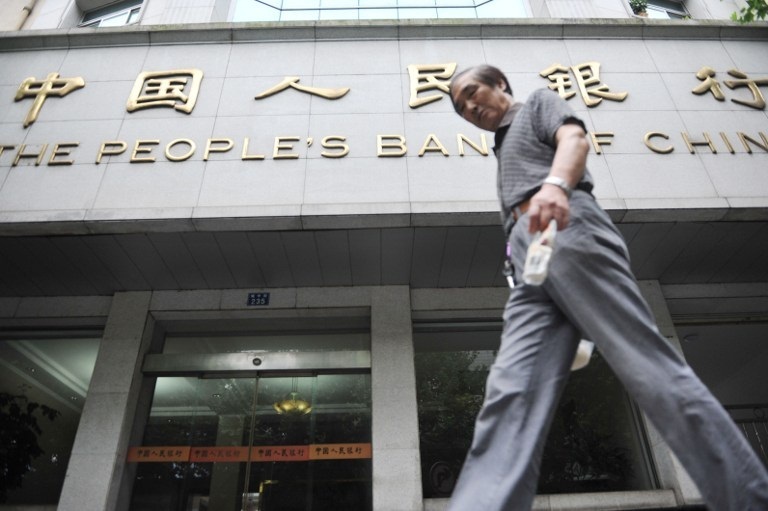 But on Saturday, the PBOC said the lower figures were the result of local governments raising funds on the bond market rather than from banks, The Wall Street Journal reported. Last week's high-level "authoritative" pronouncement was followed by reports that the government is working on a detailed plan to curb lending to "zombie" enterprises and cut production overcapacity. The plan will be piloted in about 20 cities this year, Xinhua and China Securities News said. Separately, Caixin Media and China Daily reported last week that Bank of China will restart a pilot program to dispose of bad loans by selling securities based on NPLs. Six major banks will take part in the NPL securitization test, the reports said. Doubts about the government's commitment to break the SOE debt cycle was a major factor in the rating agency decisions to change outlooks for China to negative. In March, S&P's said its evaluation was "partly motivated by our opinion that the pace and depth of SOE reform may be insufficient to attenuate the risks of credit-fueled growth." On April 29, China's regulators announced an interagency crackdown on "illegal fundraising," including Internet financing and WMP offerings, following an increase in fraud. As part of the crackdown, regulators have ordered China's big banks to make provisions for WMPs that are not officially guaranteed, The Wall Street Journal reported. But offerings by the big banks may be the easiest to track down. An earlier Wall Street Journal report in April found that 1.6 million investors were owed U.S. $24.3 billion (158 billion yuan) from failed WMPs and defaults over the past year. New cases of Internet financing crimes rose 71 percent in 2015 and reached 2,300 in the first quarter of this year, Xinhua reported. The authorities acted after police shut down online broker Ezubao in December, charging it with bilking some 900,000 investors out of over 50 billion yuan (U.S. $7.6 billion) as part of a Ponzi scheme. The crackdown aims to clean up the online financing business and reduce investor risks. But how much it has to do with the larger issues of China's debt growth, credit-driven GDP, shadow banking and SOE reform is unclear. "They have to deleverage," said Scissors. "The only way to control the flow of money from jumping from bonds to steel futures and wherever it goes next is to deleverage, and they're increasingly leveraging." "So, in addition to all the capital being wasted, they're going to get bubble after bubble after bubble," he said.